A recipe in one of my bread cookbooks called for boiling pretzels in lye. Um, boiling my food in a chemical that needs to be purchased at a hardware store? I’ll leave that one to professionals! I’m so glad I discovered that the average home cook can just boil the pretzels in a baking soda mixture! 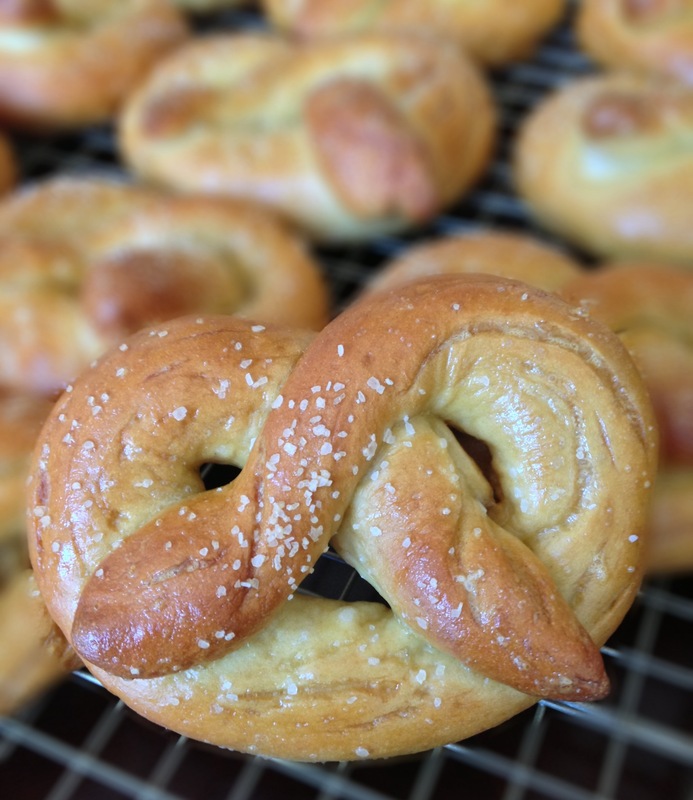 Soft pretzels are a bit time consuming, but the results are SO worth it. Chewy on the outside, soft on the inside – salty, doughy perfection! My friends devoured them!! Rolled into perfect little pretzels! Poaching the pretzels in a baking soda bath. After poaching, put them back on the baking sheet. The egg wash give it a shiny finish. Serving size is at least two! Pour warm water and 1 tablespoon sugar into bowl of electric mixer fitted with a dough hook and stir to combine. Sprinkle with yeast, and let sit 10 minutes; yeast should be foamy. Add 1 cup flour to yeast mixture, and mix by hand until combined. Add salt and 4 cups more flour, and mix by hand until combined, about 30 seconds. Knead the dough, using the dough hook, on medium-low speed until dough pulls away from sides of bowl, about 1 1/2 minutes. Add another 1/2 cup to 1 cup flour if the dough is still wet and sticky, and knead on low 1 minute more. 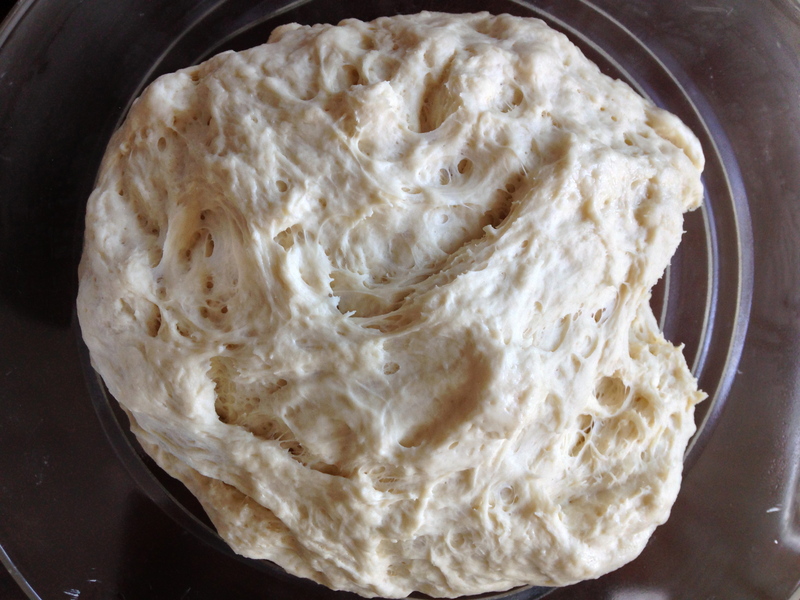 Transfer to a lightly floured board, and knead about ten times, or until smooth. This is definitely a dry dough. Pour oil into a large bowl; swirl to coat sides. Transfer dough to bowl, turning dough to completely cover with oil. Cover the bowl with a kitchen towel or plastic wrap, and leave in a warm spot for 1 hour, or until dough has doubled in size. Lightly spray two baking sheets with cooking spray. Set aside. Punch down dough to remove bubbles. Transfer to a lightly floured board. Knead once or twice, divide into 16 pieces (about 2 1/2 ounces each), put them back in the bowl, and cover with plastic wrap so that they don’t dry out. Roll one piece of dough at a time into an 18-inch-long strip. If the dough doesn’t want to roll, just keep trying! You can also let it rest for 5 minutes and then come back to it. 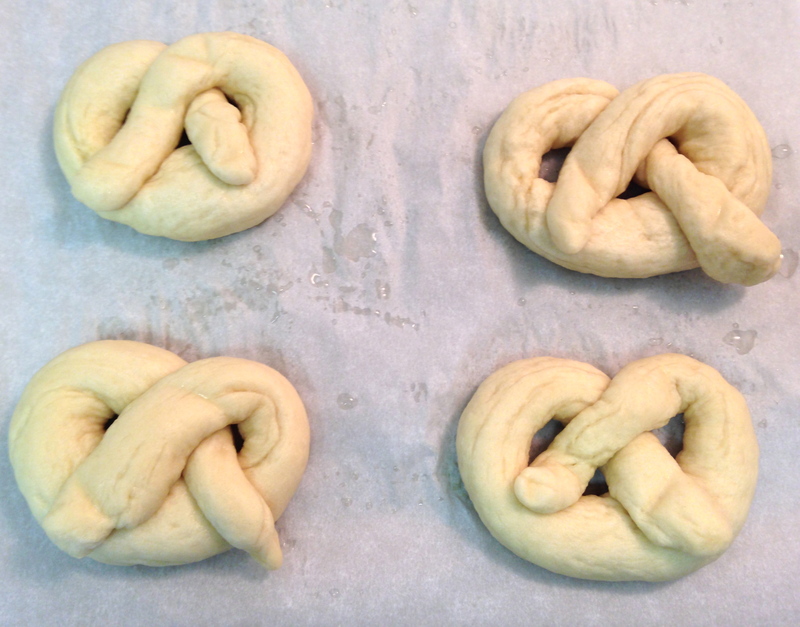 Twist into pretzel shape; transfer to prepared baking sheet. Cover with a kitchen towel. 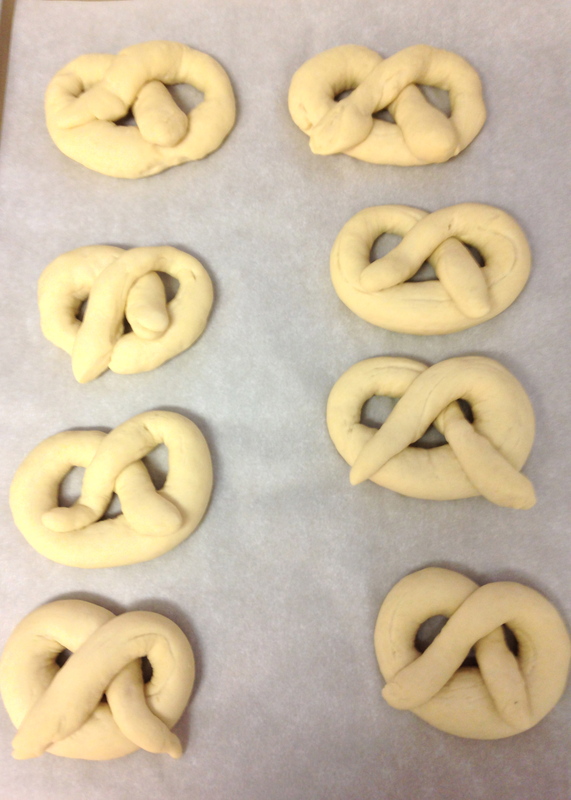 Continue to form pretzels; eight will fit on each sheet. Let pretzels rest, covered, until they rise slightly, about 15 minutes. Meanwhile, heat oven to 450°F and fill a large pot with 2 inches of water. Bring to a boil. Add baking soda (step back, it foams up quickly) and remaining 2 tablespoons sugar. 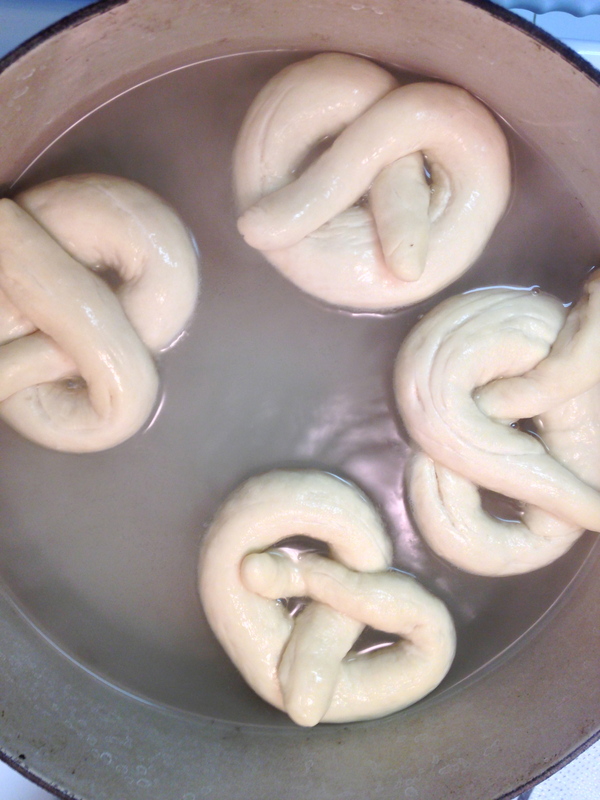 Reduce to a simmer; transfer three to four pretzels to water. Poach 1 minute on each side. Use slotted spoon to transfer pretzels to baking sheet. Continue until all pretzels are poached. Beat egg with 1 tablespoon water. Brush pretzels with egg glaze. Sprinkle with salt. Bake until golden brown, 12 to 15 minutes. Let cool on wire rack, or eat warm. 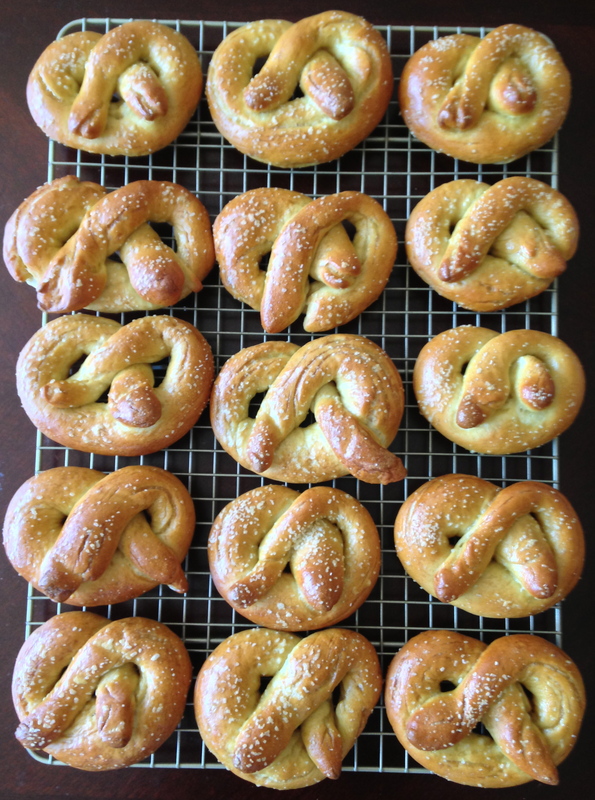 Pretzels are best when eaten the same day, but will keep at room temperature, uncovered, for two days. Do not store in covered container or they will become soggy. PRETZELS. Aww yeah. That is all. Yum! This is actually one of the first things I ever baked by myself from scratch — the recipe was in some kids’ magazine (Highlights, I think). Lost the recipe and never made them since — thanks for the reminder! 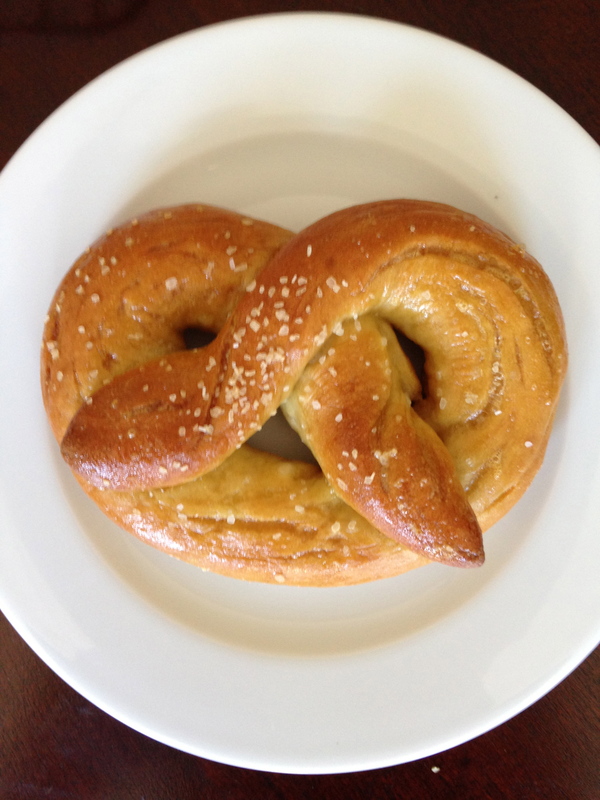 Oh — just happened to buy some pretzel bread from a Swiss bakery yesterday — SO good! 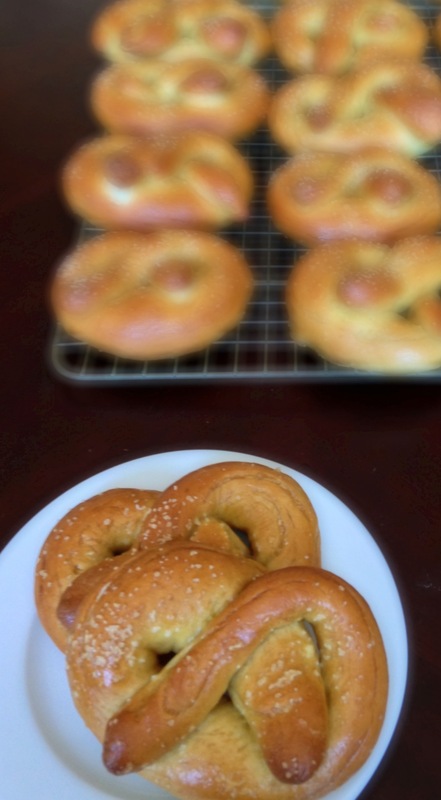 I will have to turn this recipe into pretzel bread next! I love pretzel bread, I’m sure the Swiss bakery had an amazing version! Yum! I can’t believe that crazy bit about the lye though, whoah! I know! I would be way too scared that I was going to poison myself! These look amazing Cate! 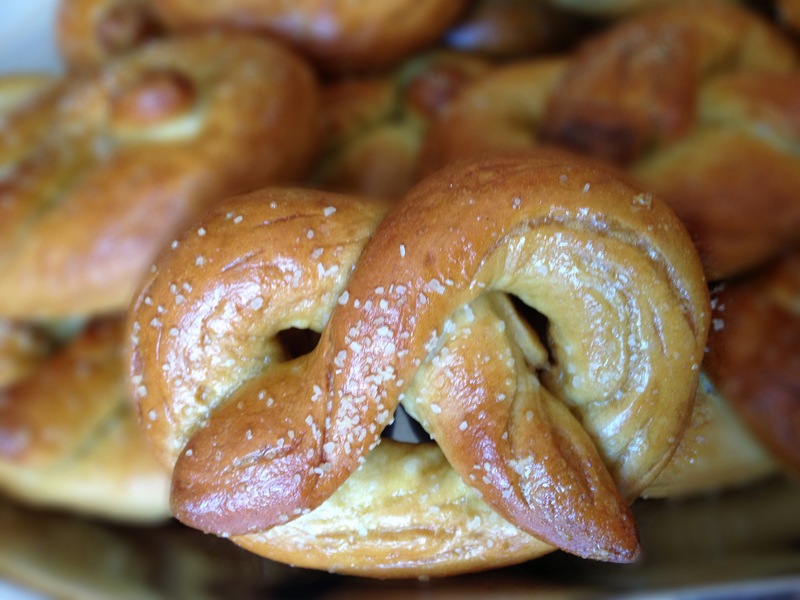 Can’t believe I missed National Pretzel Day… Pretzels are one of my favorite breads ever, I have to try this some time!